Pad Krakow Gai (ผัดกะเพราไก่) is a spicy stir-fried one dish meal made with lots of fresh basil (Kaprow; กะเพรา) and Thai hot chilies. This version posted by Khun Worawut is made with chunky pieces of chicken thigh meat with the bone in. 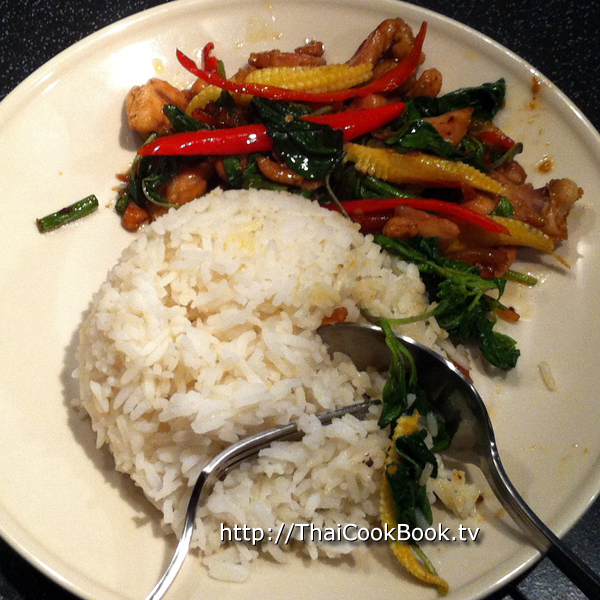 Pad Krapow can be made with chopped or sliced pork, chicken, shrimp, and other types of seafood. If you love spicy foods and dare to give this one a try, you'll quickly understand why it is one of the most popular dishes served at street-side food stands throughout Thailand. A common variation of this dish includes a fried egg on top, and it is often eaten as the first meal of the day. What's in our Spicy Stir-fried Chili and Basil with Chicken. 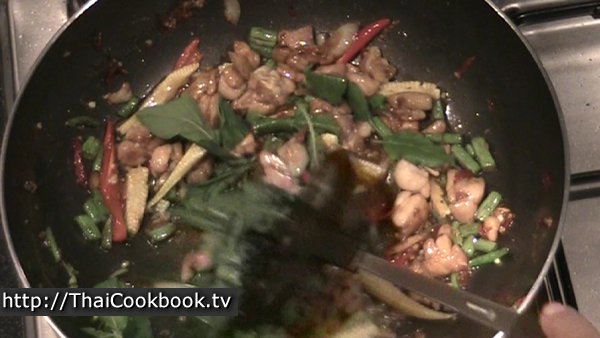 How we make our Spicy Stir-fried Chili and Basil with Chicken. 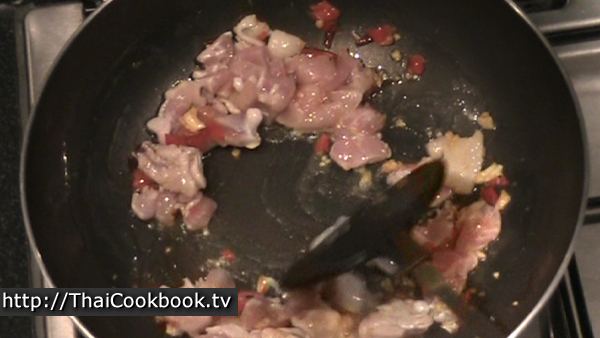 1) Chop the chicken thighs, including the bone, into 1 inch cubes. 2) Fry the crushed chilies and garlic together in oil for about seconds. 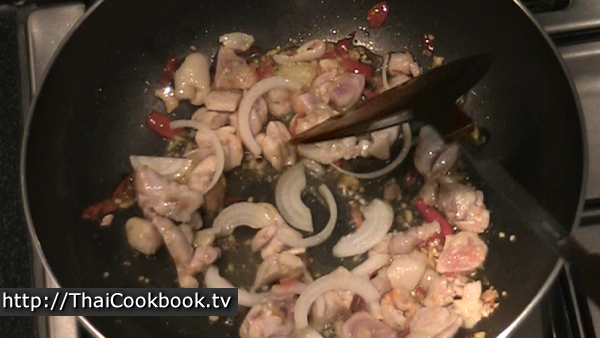 3) Add the chicken and stir it into the chili and garlic. Fry until until the chicken is cooked very well, stir continuously. 4) Add the onion to the pan, let it cook, then add light soy sauce, dark sweet soy sauce, oyster sauce, and sugar. Cook until the sugar melts. 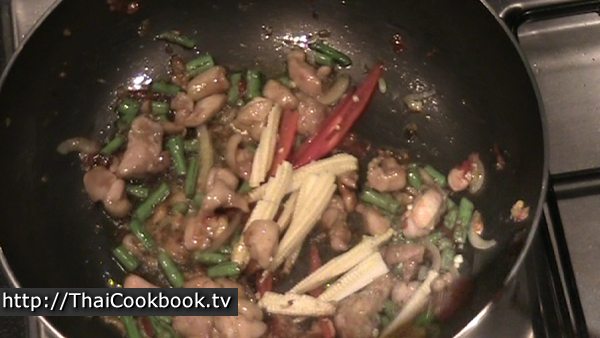 5) Add the green beans and stir fry for about another minute. Then add just a little water. Add the mild red chili and baby corns to the pan and stir fry for about 30 seconds. 6) Remove from the heat and toss in the basil. 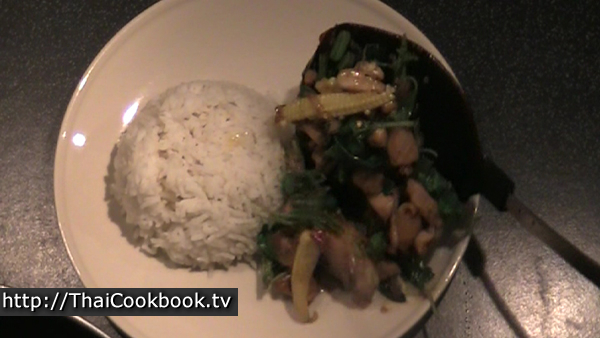 Serve immediately with steamed rice..
Click Here for a detailed step-by-step method. Our YouTube Channel features videos produced by Worawut and the team at Baan Worawut, our local Chiang Mai fast food restaurant. The recipes include some the most popular dishes we serve, family favorites from home, as well as a few more complicated Thai recipes that require hours to prepare. Planning to open a Thai restaurant? Just want to make a great Thai meal? Watch our popular lessons on YouTube or follow us and we'll teach you everything you need to know! Pin it to your board now! Select about 1- 2 large, fatty pieces of chicken thigh, enough to make about 1 cup of meat and bone when cut. Cut most of the meat away from the bone, then chop the bones in half. Cut the pieces of meat into one inch cubes, leave the skin on. Clean a nice big bunch of Bai Krapow (Holy basil, hairy basil) and pluck the leaves, enough to make about one cup of leaves. Measure and assemble the rest of the ingredients. 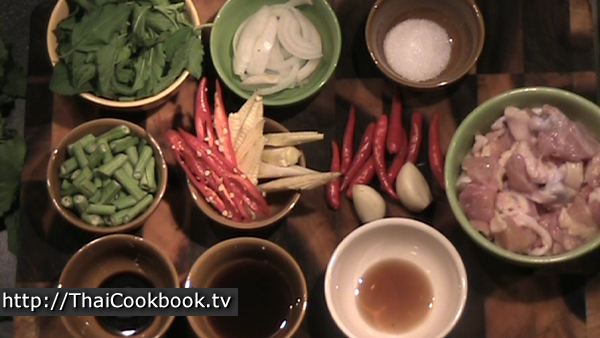 Pad Krapow is a quick stir fried dish, so you'll need to have everything ready before you start. Using a mortar and pestle, crush the hot chilies and garlic together until they are well broken up. 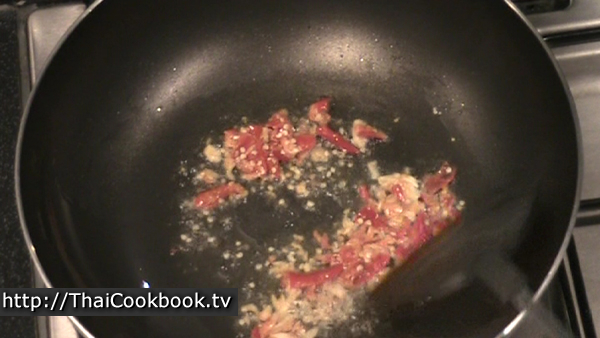 Heat 1 - 2 Tablespoons of vegetable oil in a wok or large frying pan. When the oil is quite hot, add the chili and garlic mixture and fry it for a few seconds. Add the chicken and stir it into the chili well. Fry until until the chicken is cooked very well, stir continuously. If you are using chicken with the bone in, this will take a few minutes. It will take less time if you are using sliced meat or seafood, so watch that you don't overcook the meat. Add the onion to the pan, and stir it in well. Cook for about another minute, continuing to stir the whole time. When the onion is cooked soft, add the light soy sauce, oyster sauce, and sugar. 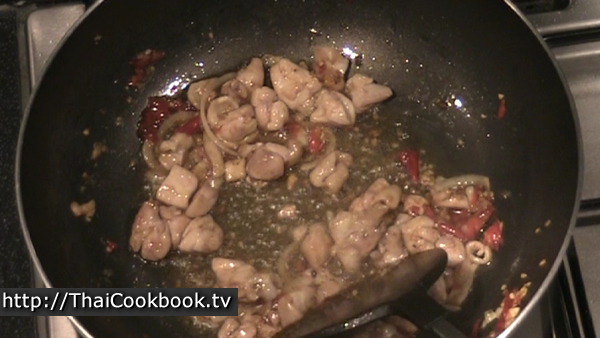 Stir into chicken and mix well until the sugar is completely melted. 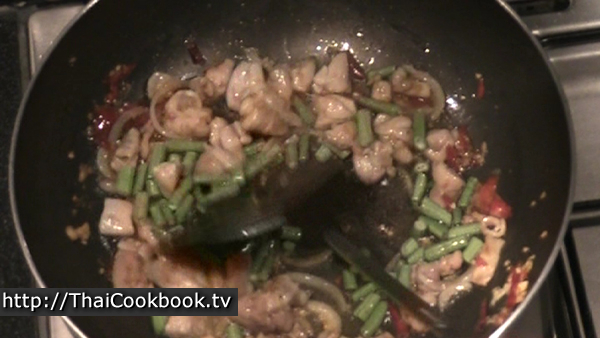 Add the green beans and stir fry for about another minute. If the pan looks a little dry, you can add about 1 - 2 Tablespoons of water. There should be a little brown sauce in the pan to coat the chicken and green beans. Add the mild red chili and baby corns to the pan and stir fry for about 30 seconds. Remove from the heat. Stir in the basil quickly as the pan starts to cool. You do not need to cook the basil. The residual heat will be just enough to soften it a little. 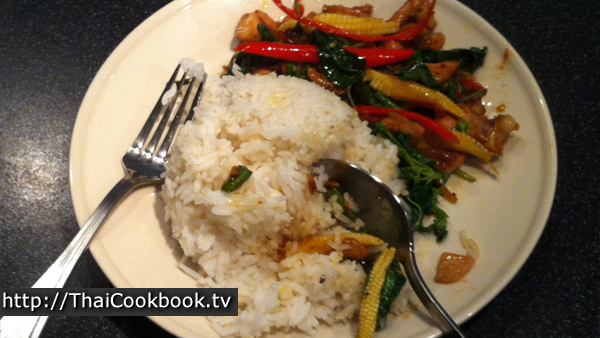 Serve immediately on a medium sized plate with a healthy serving of Thai Jasmine rice. Arrange the red chilies, baby corn, and basil so it looks delicious. © 2013 - 2019. Thailand Interactive Publishing.